Despite being central in one of the most despicable acts of unsportsmanship of all time young Nelson Piquet earned back some credit after fighting Renault all the way through the courts to quash allegations against him that he intended to blackmail Renault into offering him a new contract. 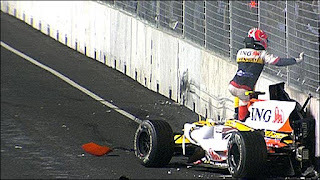 To explain the background briefly; Piquet agreed to crash on purpose at the 2008 Singapore GP in order to bring out a safety car which would result in his teammate, Alonso, winning the race. Renault issued the order vicariously through Renault boss Flavio Briatore, since banned. Renault issued a statement claiming Piquet intended to reveal Renault's dastardly plan unless they gave him a contract for the following season. Renault were telling lies. It turns out Piquet was quite happy to crash to simply help the team and had nothing to do with securing a new contract (which he never got in the end). So anyway all this simply means that Piquet was vilified even more than he should have been thanks to Renault's accusations. Its all a sorry mess really but there is a modicum of relief in the knowledge that amongst all the mudslinging, including hyperbolic claims that lives were put in danger because of the intentional crash, the truly outrageous stuff can be filtered out.